classy.ultra light,just about 1 gram,you even will not feel the weight increase to your iwatch. precise cut-outs,fit for your iwatch very well. 7.A perfect gift for good friends,business partner,sisters and brothers,parents,etc. 【High Performance Material】Slim and Sensuous With Military Grade Protection and ZERO Compromise, made of 100% carbon Fiber. Now, your watch is protected with the same material used in military, spacecraft,race cars and sports equipment.It's quality is lighter than aluminum, but the strength is stronger than steel and corrosion resistance, Yet, it retains the thinness of your watch the day you purchased it -- before it was covered up with an thick bulky case. 【Ultra Thin and Light】Enjoy your "almost naked" watch with a case that is thinner than a dime. Thickness 0.03in. Min. Weight 1 Gram. So light that you even will not feel the weight increase to your watch. but it provide unparalleled protection to your watch. 【Use Friendly】No harm to your watch surface,it's softer than stainless steel case and stronger than TPU+PC case.No influence to wireless charging and Monitor the heart rate. 【Fits Your Watch Perfectly】Our secret process for vacuum forming technology ensures the cases are perfectly formed to the watch's size. Easily and naturally access all buttons and ports. Each opening is not only accurately aligned, but also at natural surface level.Only compatible with iwatch series 2/3 42mm. 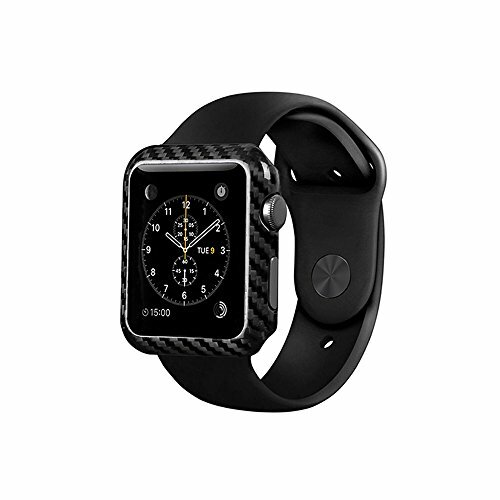 【What You Get】1*Luxurious Carbon Fiber Apple Watch Case,1*Exquisite Gift-wrap.It's really a perfect Gift for your friends,brothers or sisters,lover,partners on birthdays and all kinds of Festivals.